Just for Kicks! : 600 Knock-Out Jokes, Puns and Riddles About Sports hits the shelves today! Kids love jokes. Kids love sports. Just for Kicks offers completely original sports jokes for fans of any age. It’s chock full of jokes from one-liners to knock-knocks about dozens of sports sure to please any young laugher and sports nut. Sure, you’d expect to find jokes about soccer, baseball, football, basketball, and hockey, but also curling, sumo wrestling, and jai alai? That’s a book with a joke for every budding comic out there. How did the college quarterback hurt his hand? He hit the books. 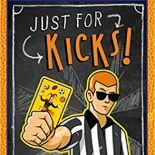 Just for Kicks can be found at Amazon, Barnes & Noble, Target, and independent bookstores across the country. Fall is the busiest sports season of the year. Why not throw more than a little fun into your sport with hundreds of jokes sure to score with your young reader? What do you call a hockey player with all his teeth? A rookie. Did you hear about the boxer knocked out by Dracula? He went down for the count. Just for Kicks is sure to keep ’em laughing. There are so many jokes, we threw in an Extra Innings chapter just to fit them all in. Here’s hoping your young jock stays jocular with this collection of hilarious jokes! Just for Kicks! 600 Knock-Out Jokes, Puns and Riddles About Sports by John Briggs (Published by Sterling Children’s Books, September 11, 2018). Just $6.95! So, like the comedians says, “Always leave ’em laughing.” Remember that jai alai joke? Why was the jai alai reporter so good? He always got the scoop. What race gives the winner bicycle shorts? The Tour de Pants! Thanks for checking out Just for Kicks and giving your young reader the gift of laughter! This entry was posted on September 12, 2018 by johnbriggsbooks in Book Release, Books, Children's Books, humor, joke books, Just for Kicks and tagged children's books, humor, joke books, kidlit, sports.